Home Forums JUST FRIENDS Trivia Night! This topic contains 45 replies, has 21 voices, and was last updated by Melissa 1 year, 5 months ago. Not sure if this is the best place to put Community events but I’m just going to put this here…. Newbies and veterans alike come join the monthly (3rd Monday of the month) trivia gathering! We will definitely try to be there tomorrow night! Thanks, Melissa! Thanks Melissa! Will try to join as well. @jayfurby let’s go to this!! ? We’re gonna go for sure. Excited to meet some fellow lusters in person! Can’t wait trivulate with you all. I wish I wasn’t sick! This sounds like so much fun. Are peeps going to trivia this coming Monday? I would be super down to go if it’s happening! Yo dudes! Trivia is coming up! Please show up 10-15 minutes early to assemble teams/order food & drink. Awesome, I’ll try to make it to this one. I can’t belive I meme’d my way into trivia team names. I’m not even there! You guys are the sweetest. Here’s a group photo from trivia last night! Please mark your calendars for next month trivia meetup: April 17th. We can all cry in our beers before hand over taxes. @clairebuch The paranoia has officially set in. @mike So stoked for My Shadow Life Podcast Ep. 1. Two and a half GLORIOUS hours of redacted puns. @lilmsfancpants 2 hours of just one long beep haha! Nice “OSDM Deleted” @mike. 🙂 Maybe when I’m out there in July I can join y’all for one of these? Alright, it’s near that time again! I am trying to make it to one of these too, loves! I am a font of useless facts that will hopefully find their home at trivia nights. ? Oh derp. First read-through for the play. I may be able to catch the last few minutes. Just remember the answer to every fifth question is “PLANT”. Yay! I’m going to trek out there, see you tonight! Heading out a little early, traffic is expected. See you there! Wow Lusters dominated the score board tonight! Alas in a game with two teams there must be losers (hey 3rd place isn’t bad) and winners. You can probably tell who won FIRST PLACE–way to go Team Smear Campaign! 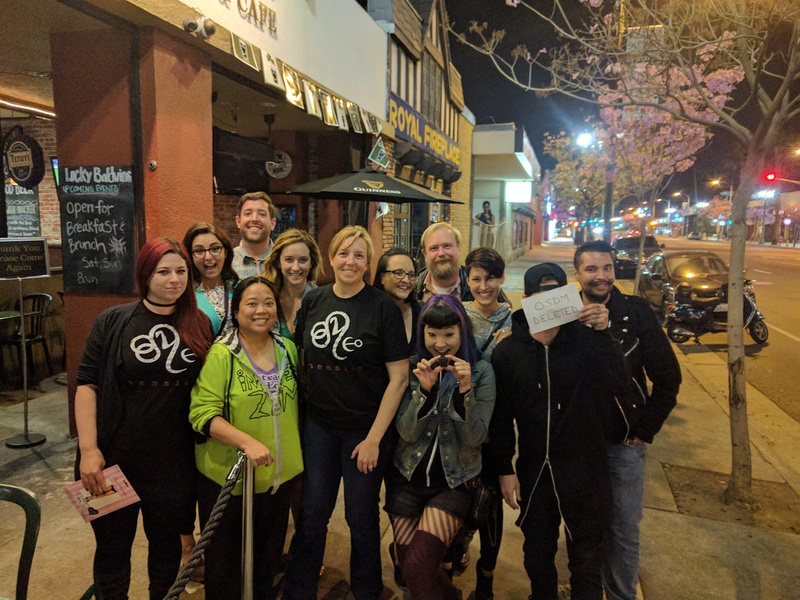 May Trivia Meet Up! I hope to see you then! Curses! That’s the night I start moving in to my new apartment. Next month! So, uh, you might want to anticipate having a few “unexpected guests” tonight. I will be sans music genius Jack but I will come too!